Hall, D. V., Jones, S. C. & Iverson, D. C. (2009). 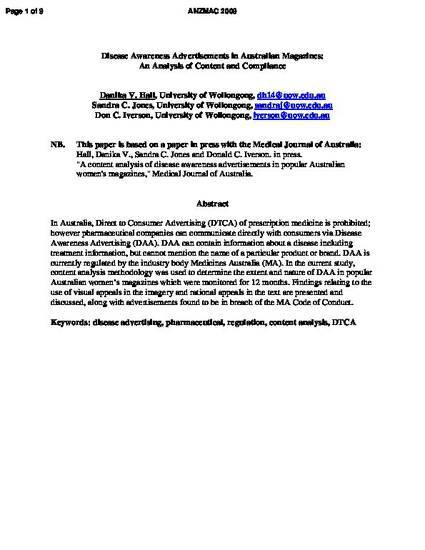 Content analysis of disease awareness advertisements in popular Australian women's magazines. Medical Journal of Australia, 191 (11/12), 625-629. Objective: To examine the nature of disease awareness advertising (DAA). Design: Therapeutic advertisements in six popular Australian women’s magazines were monitored between April 2006 and March 2007. A subset of advertisements was included in the study based on criteria derived from a definition of DAA. Unique advertisements were analysed by four independent coders. Main outcome measures: Types of advertisements and their sponsors, the types of disease information present, and the persuasive techniques utilised. Results: Of 711 advertisements identified, 60 met the inclusion criteria for DAA, and 30 of these were unique. Over one-third of the advertisements were classified as “unbranded product advertisements”, which promote a product without referring directly to a brand. DAA sponsored by pharmaceutical companies most often provided treatment and prevalence information. Most (22/30) advertisements used emotional appeals; 15 of these used “happiness/healthiness/wellbeing”. Conclusions: The educational value of industry-sponsored DAA could be improved if regulations and guidelines stipulated disease information requirements, such as inclusion of risk-factor and symptom information. Regulators should provide guidelines for “unbranded product advertisements” and the acceptability of other persuasive techniques. Further research into DAA is required and should consider advertisements in a range of media, and behavioural responses.